1. Want to know how to make that cute scallop border on the oval? 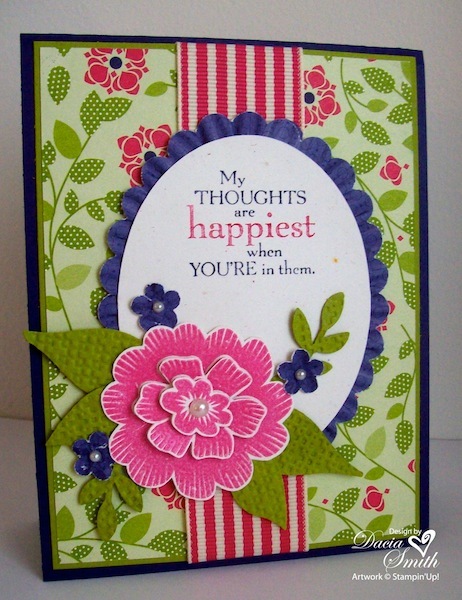 Cut a strip of designer paper and punch down one side using your Scallop Edge Border Punch. Then run the punched strip through your Crimper. Apply Sticky Tape to the back edge of your oval. Attach your strip forming to the oval as you go. Now give it a try, I know you can do it! 2. The sunny blossom was stamped with Versamark three times and embossed using Melon Mambo Embossing Powder. Then cut each blossom and layer using dimensionals. 3. Pull the project together with the coordinating Melon Mambo Striped Grosgrain Ribbon. 1. The scallops are really 2″ circles cut using the Circles #2 Original Die. 2. Each circle adorns an embossed pattern using the Snow Burst Textured Embossing Folder for great feel and a fun new look. 3. Shoot your photos up close to capture great smiles, dimples, and all those facial features that seem to age with the passing of time. Joshua’s smile is the favorite part of my day! Hope he’ll serve to brighten yours. 1. We gathered at the Robinhood Road Family YMCA last night to scrapbook our memories. Each participant received a thank you gift for attending, a template, and all the supplies to complete today’s post. We enjoyed a relaxing evening having fun with friends. Missed the class and want the template? All $50. orders placed through my website this month will receive my class templates prepared for the month free of charge. You will receive the files via email in a pdf format at the close of the month. 2. Gently Falling is used in this layout to create custom designer paper. Looking for that perfect match of card stock and accessories? 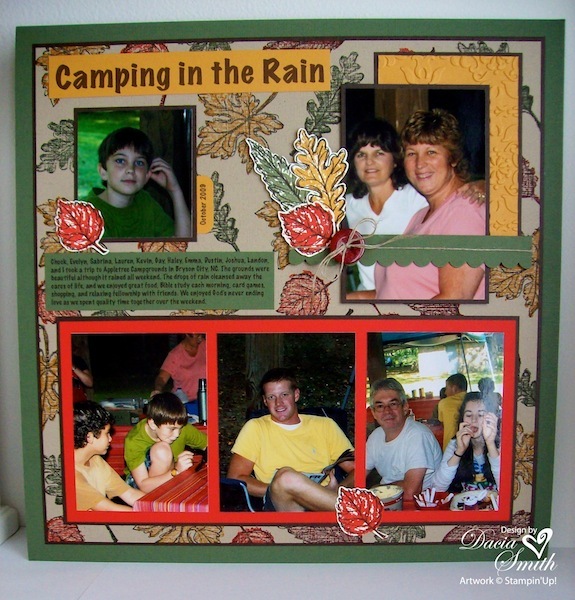 Stampin’ Up’s ink, card stock, and accessories coordinate helping you to capture a beautiful memory you can share with friends and family. 3. The design elements were created by stamping the leaves on Very Vanilla Card Stock, cutting with Paper Snips, and applying at various spots in the design. They coordinate beautifully with the designer paper and add a nice “pop” to the overall look of the page. The added bonus, they are a fraction of the cost found at your local box store, and you gain a creative coach to help inspire your crafting! 1. Fall is a wonderful time of the year. It gives us an opportunity to reflect over the year and offer thanksgiving for all of our many blessings. 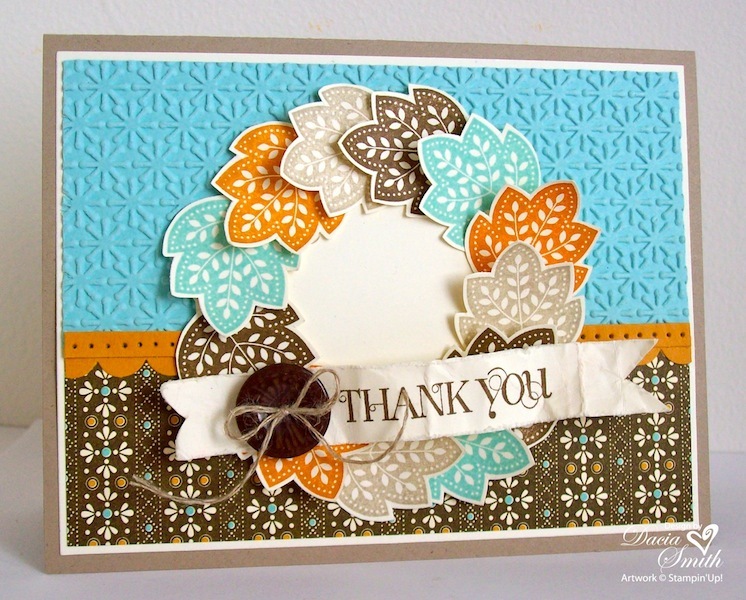 Will you consider creating a thank you card this week and sharing it with someone you hold dear? Mine follows the Sweet Sunday sketch challenge 133 over at the sweetest thing. 2. 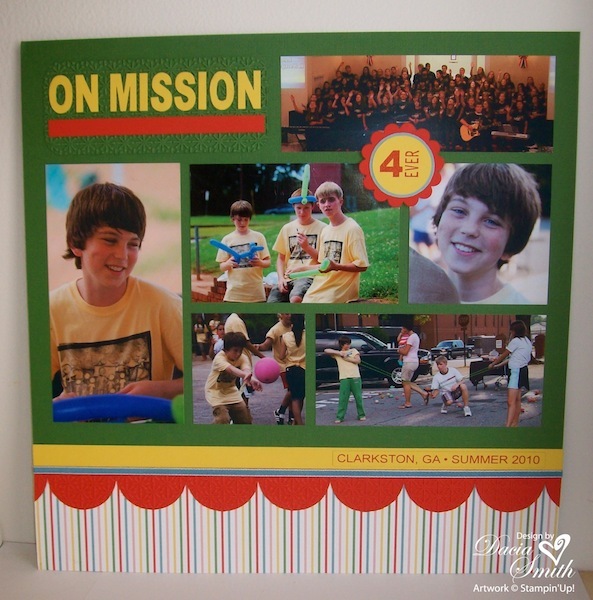 The Snow Burst Textured Impressions Embossing Folder works for more than just snow days. Try using it for another holiday of the year. 3. Creating the wreath using fall leaves from Day of Gratitude was easy. Cut a 3″ circle with your Circle Scissor Plus and randomly apply leaves around the circle following the outside edge for a pattern. Each leaf was stamped in coordinating colors pulled from the yummy Spice Cake Designer Series Paper.